Summer days are almost here. The season of colours has already arrived after a long, slow spring. It’s humid though. A strange ill wind blows, haar has come in from the east coast on some days. Cool buildings are enticing, as is the grocery in the village. I took a walk over and came back with a medley of veg and fruit. As supermarkets start to bag everything in plastic for fear of people stealing from self-serve checkouts, the small shop has its appeal when all you need is one or two of everything, or prefer brown paper bags! So when you have all your fresh fruit and veg in your basket, it’s time to quickly turn it into delicious summer salads. One of my favourite salads is Mexican bean. There are variations on this recipe, this is my interpretation. Hot chilli sauce – make some! A glug of olive oil, some ground black pepper, splash of cider vinegar, juice from half a lime. Put all the ingredients in the bowl and fold gently with a large spoon. Eat immediately. It does save well in the fridge for a couple of days. I had some today with falafel, brown pitta bread, green lettuce leaves, a little yoghurt. I have wanted to write a little bit about Frida for some time, why she and her art are important to me, and perhaps lots of people. 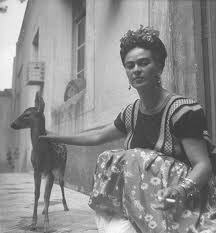 I think I can recall when I first saw Frida’s work and images of her, I was around thirteen years old. There was something about her that felt very familiar – her dress style, her moustache, her braided hair and flowers. I love that she embraced her culture through her sense of dressing, of looking. She carried it off, it was all hers. She was Mexican, I could relate to this too. Colour, brass bands, violence, cuisine, religion blending pagan and christian, ritual – there were similarities. She straddled tradition and modernity blended with surrealism and dreams – something that I love – the crossing over, merging, creating something frighteningly new out of an old world. Frida also depicted her pain, her body in anguish, her torment through startling work which lingered in my mind – those images we all know, can relate to perhaps when we are hurting. I admired her bravery and also understood her need for self-expression. What she did for herself, she did for many women. She is of course an icon now. I have Frida earrings, art books, postcards and would happily have more. I have seen a couple of her pieces live and would like to visit her Blue House one day. She didn’t save the world, she was in love with a man who let her down, and she followed around, but she’s still with us today and her presence and work is, I believe, of value to understanding our state of being – of living with pain but finding a way to thrive. 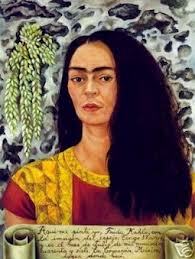 Since her death, Kahlo’s fame as an artist has only grown. Her beloved Blue House was opened as a museum in 1958. The feminist movement of the 1970s led to renewed interest in her life and work, as Kahlo was viewed by many as an icon of female creativity. In 1983, Hayden Herrera’s book on the artist, A Biography of Frida Kahlo, also helped to stir up interest in this great artist. More recently, her life was the subject of a 2002 film entitled Frida, starring Salma Hayek as the artist and Alfred Molina as Diego Rivera. Directed by Julie Taymor, the film was nominated for six Academy Awards and won for Best Makeup and Original Score. What is the value of the artist? We don’t always know at the point in time that they are creating, they are active. But we can feel their presence for decades, centuries after their death. There’s something about this that I like.